MANILA, Philippines - The Securities and Exchange Commission (SEC) today filed a case against EmGoldex, Global Intergold, and Prosperous Infinite Philippines Holdings, Corp. (PIPHC) for selling unregistered securities to the public without a license. According to SEC, related entities of EmGolDex violated Section 8 and 28 of the Securities and Regulation Code. Each violation of the SRC is punishable, upon conviction, with a fine of not more than Php 5 Million or imprisonment of 7-21 years, or both. SEC also issued a Cease and Desist Order (CDO) on Thursday, November 5, 2015. The filing of the aforestated cases and the issuance of a CDO by the SEC are products of months of investigation, including the previous issuances of SEC Advisories and Disclaimers against EmGoldex. With the help of the DILG, PNP, NBI and NICA, the SEC was able to gather evidence including affidavits of two (2) victims who are active PNP officials. They have also recruited at least 95 investors. An estimated Php 2,718,400.00 cash investment has already been made by them with an estimated return loss of at least Php 11 Million. One of the two PNP officials invested in EmGoldex in desperation after his house burned down early this year. Per Asst. Dir. Lalaine Monserate of the SEC’s Enforcement and Investor Protection Department (EIPD), the said entities operate a classic Ponzi scheme of getting cash investments and giving high return payouts thru the recruitment of people. As more people are recruited into the scheme, it eventually reaches a point wherein it can no longer sustain its payouts, and payments will stop thereby leaving investors penniless. 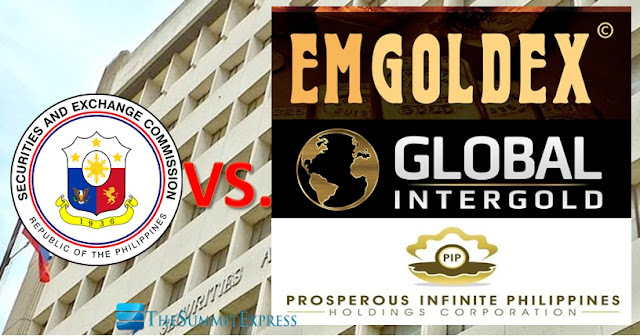 Originally, the entity which employed the Ponzi scheme was EmGoldex. However, in response to SEC’s Advisories warning investors against EmGoldex, the original entity renamed itself to GIG. PIPHC was then incorporated sometime on August 2015 to aid and assist GIG investors who were unable to obtain a return on their investment. Currently, EmGoldex is already banned in other countries based on international media reports. The selling and marketing of unregistered securities by EmGoldex, GIG, and PIPHC are largely done online. Crimes committed in cyberspace and through the use of Information and Communication Technologies (ICT) carry a higher penalty as provided under the Cybercrime Prevention Act of 2012. Commission, in its commitment to protect Filipino investors, is ready to receive and assist victims, including OFWs, with their affidavits. The Commission also warns the public regarding the upcoming event scheduled by the said entities at the SMX Convention Center on Sunday, 8 November 2015, at 5:00pm wherein an estimated 2,000 people will be attending. With the Aquino administration’s focus on anti-corruption initiatives, the SEC challenges the individual suspects namely Mr. Kevin Miranda, Mr. Ryan Manuit, Mr. Charles Juiz Padilla, Mr. Rabel Ymas, Mr. John Rafael Calicdan, and Mr. Paul Alviar to face the public and take accountability for their actions.